Class Activity Report: View or print an overview of student activity that includes number of activities, time on task and last login. Graded Spelling/Vocab Tests: Select, view and print students’ graded Spelling and Vocabulary tests. Spelling/Vocab Test Summary: Select, view and print a summary of words that students correctly or incorrectly answered on their tests. 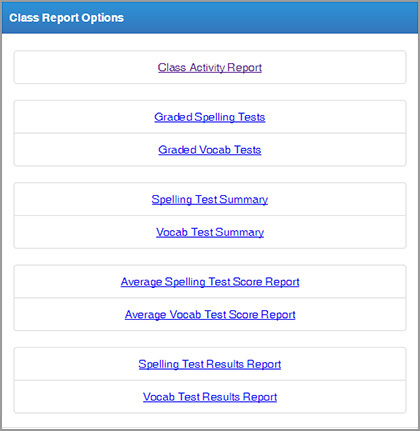 Average Spelling/Vocab Test Score Report: Select, view and print student averages on tests. Spelling/Vocab Test Results Report: Select, view and print student test results. To generate a Class Report, select the report you’d like to view, print or download. Your next step is to select the lists and students or groups you want to include in your report. To select individual students, scroll down passed the groups and select the checkboxes next to the students’ names. When lists and students are selected, press the View Report button. If pop-up blockers are enabled, you will need to allow pop-ups from VocabularySpellingCity. To view an individual student’s test results, click the linked score.